Erin Miller | Galion Inquirer State Rep. Riordan McClain, who represents Ohio’s 87th District, speaks to students Thursday in one of Bill Stepro’s history classes at Galion High School. Stepro and his students will go to Columbus next month to tour and see the Ohio House of Representatives in session. 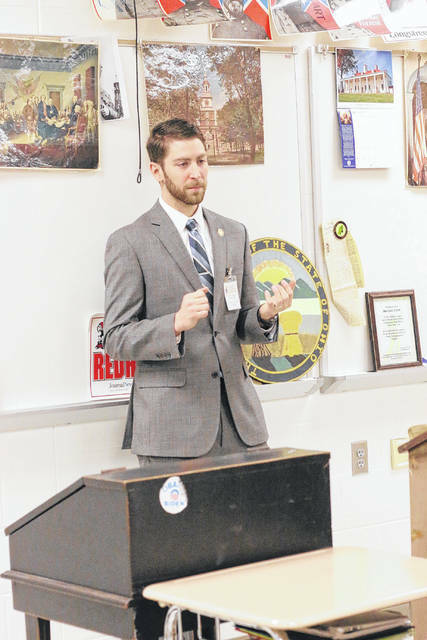 GALION — Newly-appointed State Rep. Riordan McClain, who represents Ohio’s 87th House District, which includes Galion, visited Galion High School on Thursday and spoke to students in two of Bill Stepro’s history classes. McClain, of Upper Sandusky and the son of former Rep. Jeff McClain, took office in January to fill the seat left vacant by the resignation of Rep. Wes Goodman in late 2017. McClain introduced himself to students and gave them some insight into his prior experiences in the business world. After speaking about his experiences — both professionally and personally — McClain posed questions to students to get their opinions on current legislation on topics ranging from abortion to the possibility of naming the Labrador retriever Ohio’s official state dog. Stepro questioned McClain on the topic of school testing and current school processes. At the conclusion of the class, McClain opened up discussion to allow questions from students and was asked what his thoughts and feelings were about school safety in light of recent events and threats across the country. Students in Stepro’s classes will visit McClain next month in Columbus to tour the Ohio Statehouse and see the Ohio House of Representatives in session. https://www.galioninquirer.com/wp-content/uploads/sites/38/2018/03/web1_IMG_1124.jpgErin Miller | Galion Inquirer State Rep. Riordan McClain, who represents Ohio’s 87th District, speaks to students Thursday in one of Bill Stepro’s history classes at Galion High School. Stepro and his students will go to Columbus next month to tour and see the Ohio House of Representatives in session.